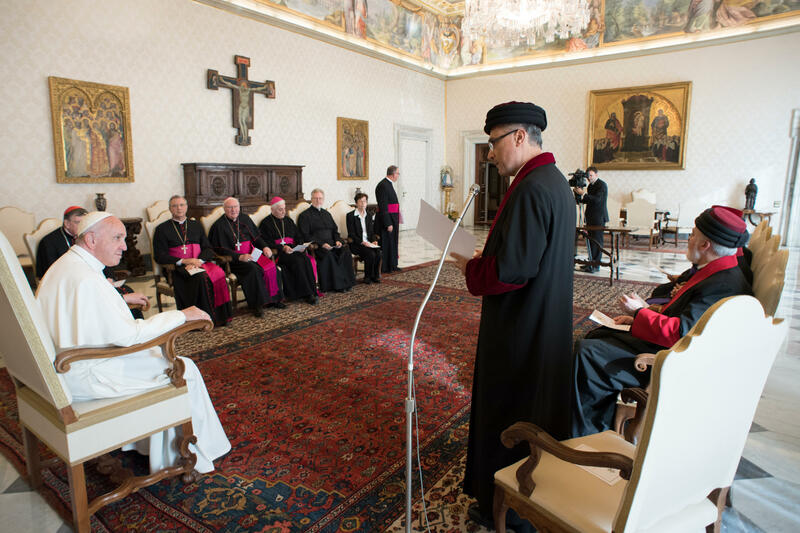 “I would like to emphasize one aspect of the new Joint Declaration, where the sign of the cross is referred to as ‘an explicit symbol of unity among all sacramental celebrations’”, Pope Francis said November 24, 2017, during an audience with Members of the Joint Commission for Theological Dialogue between the Catholic Church and the Assyrian Church of the East. I would like to emphasize one aspect of the new Joint Declaration, where the sign of the cross is referred to as “an explicit symbol of unity among all sacramental celebrations”. Some authors of the Assyrian Church of the East have included the sign of the cross among the sacred mysteries, convinced that every sacramental celebration depends precisely on the Pasch of the Lord’s death and resurrection. This is a beautiful insight because the Crucified and Risen One is our salvation and our life. Hope and peace come from his glorious cross, and from the cross flows the unity of the sacred mysteries we celebrate, as well as our own unity, for we were baptized into the same death and resurrection of the Lord (cf. Rom 6:4). When we look at the cross or make the sign of the cross, we are also invited to remember sacrifices endured in union with Jesus and to remain close to those who today bear a heavy cross upon their shoulders. The Assyrian Church of the East, along with other Churches and many of our brothers and sisters in the region, is afflicted by persecution and is a witness to brutal acts of violence perpetrated in the name of fundamentalist extremism. Situations of such tragic suffering take root more easily in contexts of great poverty, injustice and social exclusion, largely caused by instability, often fueled by external interests, and by conflicts that have also led in recent times to situations of dire need, giving rise to real cultural and spiritual deserts, within which it becomes easy to manipulate people and incite them to hatred. Such suffering has recently been exacerbated by the tragedy of the violent earthquake on the border between Iraq, the homeland of your Church, and Iran, where your communities have also long been established, as well as in Syria, Lebanon, and India. With these sentiments, both heartfelt and hope-filled, I invite you to keep journeying, trusting in the help of many of our brothers and sisters who gave their lives in following the Crucified Christ. They, who are already fully united in heaven, are the heralds and patrons of our visible communion on earth. Through their intercession, I also pray to the Lord that the Christians of your lands may continue to labor in peace and in full respect for all, in the patient work of reconstruction after so much devastation.